Learning how to crochet a blanket can be a great project for the novice. Blankets are the perfect choice for crocheting beginners. By learning just a few basic crochet stitches, you can easily finish a blanket and progress to more challenging projects. Before starting to crochet, you have to decide on a few things first. Are you making a baby blanket? If not, how big do you want the finished blanket to be? The typical size for a baby blanket is approximately 36 inches X 40 inches, while a full sized blanket can be much longer depending on your needs. Choose appropriate colors as well. Baby colors usually consist of pastels such as blues, pinks, and yellows. For adult blankets, the sky's the limit. Many crafters like to use contrasting or darker colors for the edges of the blanket. You can use also color combinations if you're making squares and slowly unravel a colorful piece of artwork. You will need a hook, some yarn, and a pattern to get started. With regards to hook sizes and weight and thickness of yarn, you have infinite choices. Visit your local craft store and consult with an associate who can assist you in picking out the right yarn and hook, or even in selecting a complete kit for your blanket. For the next step, you have to select which kind of stitch you want to use. 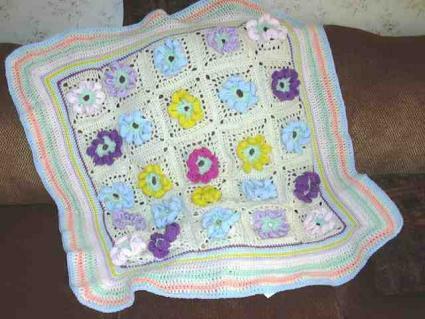 The simplest and most common methods of crocheting a blanket are through either a singular pattern or granny squares. To crochet a blanket with a singular pattern, start doing a chain that is your desired width for the blanket. Do this by making a slipknot then placing your crochet hook right through the loop. Then, pull the loop you've created and secure it by the hook. Knot the loop tight so you can smoothly move on to the next loop. Continue with the chain until you've reached the desired length for the blanket. Turn chain number two. Create a double crochet on chain number two that is measured beginning from the hook followed by each succeeding chain stitch across. For each stitch you make, do a double crochet all throughout on the top of the following stitch. Do this repeatedly until you've reached the preferred blanket size. After crocheting one stitch after the other, simply follow this routine until you finish. The number of chain stitches should be divisible by 5 or 10. This way, it will be easier to keep track of your stitches to avoid unintentionally increasing or decreasing the number of stitches per line. If the crocheting is done just on the far ends of the loops, you will achieve an attractive ridged look on the end product. To obtain a fun vertical zigzag pattern, simply skip after every tenth stitch and then double on the tenth stitch. If you opt to use a granny stitch, you'll need to follow a slightly different procedure when learning how to crochet a blanket. When you've chosen your preferred blanket size, determine what size of squares you will need to match or fit the size of the whole blanket. After this, choose your preferred color combination. Granny squares are a great way to mix colors for a unique pattern. Squares with varying colors can be created by crocheting each of the rows using different or alternating colors. Just make sure you have more than enough yarn for this project. Start crocheting each individual square and collect them until you have enough to complete your project. Once you are done with all the squares, slip stitch them together in rows. After putting them together, crochet the border you want to finish off the blanket. The granny squares can be in the form of octagons or hexagons depending on your treatment and on the number of clumps you crochet into the center. Don't be intimidated by crocheting. One great thing about the craft is that you can easily redo a few stitches or an entire row. If you made a mistake, simply unravel the stitches and start over. This makes a blanket a perfect starter project; even if you don't know how to crochet a blanket, you can learn as you go. Crocheted blankets make perfect gifts for family and friends. Send them as baby shower presents, birthday and holiday gifts, or for no occasion at all. They are a precious way of showcasing your crocheting skills to your loved ones and letting know that you care for them.